Car collectors and automotive professionals know all too well how quickly a garage can become overcrowded. 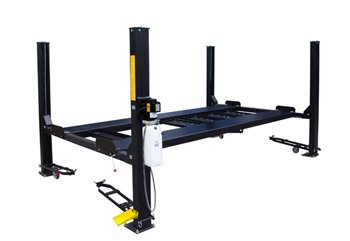 Reduce downtime and save on valuable floor space in your service bay or storage area by exploring our selection of Auto Lift™ parking lifts. 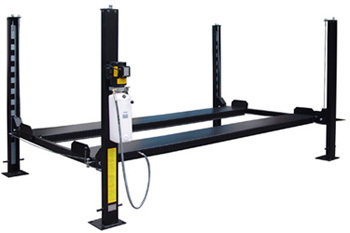 Our assortment includes Auto Lift™ parking garage lifts with lifting capabilities that range from 6,000 to 9,000 pounds for an array of automotive applications at home or in an industrial environment with demanding requirements. We proudly offer both two- and four-post models to accommodate any garage shape or size. 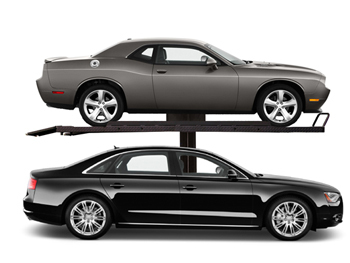 All the unique Auto Lift™ parking lot lifts we carry are designed to be powerful and smooth to operate. Each unit has the strength and durability to hold vehicles in elevated positions for extended periods of time. The stable construction is far from hard to use. The user-friendly design includes a completely enclosed carriage for safety, aircraft-quality cables rated at 14,500 pounds, lock-release handles, and a whole host of other beneficial features. 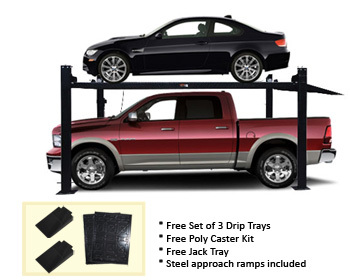 Enjoy the convenience of aluminum ramps as well as stackable polyurethane drip trays that provide extra options for keeping vehicles and work areas clean and damage-free. Looking for extra mobility? 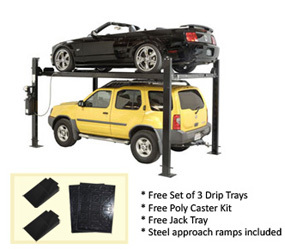 Each of our Auto Lift™ parking lot lifts include one-step caster kits that require no tools and are easy to install. Just pin them on and lower your lift! All you need to do is turn your lift sideways to park two vehicles underneath and keep storage simple. Best of all, the solid deck design allows you to easily store snowmobiles, ATVs, garden equipment, and other recreational equipment or machinery. The sky is the limit when you have any of our Auto Lift™ parking garage lifts by your side. When it comes to the productivity of your business, you’re making the smartest decision by choosing Auto Lift™ parking lifts. We offer interest-free financing options so you can stay within your budget without compromising on quality. Submit your application without any obligation to buy today! Have questions or need help finding the right solution to suit your needs? Contact one of our customer support representatives by calling toll-free for further assistance. We are here to help!